17km from the centre of the north-Polish city of Bydgoszcz, a palace at the village of Ostromecko has a history of being both a hideout and a place of escape. Like much of Poland herself, the palace has sporadically shapeshifted and changed hands between owners and invaders over the years since being erected in the mid-19th century. Polish partisans, Napoleon's army, and Prussian troops all at one time or other utilised the palace as a base of operations during one of the many battles to have swept through the Polish countryside. With its vast collection of pianos, ornate classical buildings, and ponderous Italian and English styled gardens, it’s long since been repurposed as a publicly owned venue, restaurant, and hotel, often hosting gigs during the warmer months. It’s also the location in which Innercity Ensemble have recorded their third album. Fellow Poles Księżyc similarly recorded their recent Rabbit Eclipse at the Królikarnia palace in Warsaw, but while both that album and location billow into churchlike baroque rituals bathed in echo, Innercity Ensemble’s latest has more the feel of a gang of partisans scheming late at night, hidden away outside the city, as they explore a (lower case) catholic jungle of sounds. This discrepancy between the lower case catholic music scene in Poland (well documented on The Quietus) and the upper case Catholic culture that dominates the country is perhaps the most extreme in Europe. (That having been said, Theresa May’s steadily worsening British Reich could see things soon change.) A very recent YouGov poll found 78% of adults in Poland to hold what they described as ‘authoritarian populist’ views, defined as "a combination of anti-immigration sentiments, strong foreign policy views, and opposition to human rights laws, EU institutions, and European integration policies." Conservative and repressive politics, however, have never been able to stem Polish appetites for some form of jazz or progressive musics, notably taking cues from outside of white western traditions. Stalinism, even, could barely repress jazz from being smuggled into the country via shortwave radio from America and elsewhere, and following the dictator’s death the genre became a potent force in the country’s musical culture. A visit from Dave Brubeck in 1958 officially debuted American cool jazz in the country, while Polish players such as trumpeter Tomasz Stańko and keyboardist Krzysztof Komeda (best known for his scores for Roman Polanski) emerged in the 1960s to develop what they deemed not only a Polish but a distinctly "European" form of jazz. Innercity Ensemble is a supergroup of sorts, bringing together members of Polish groups such as Alameda 5, HATI, Stara Rzeka, Sing Sing Penelope, and T'ien Lai, all of whom play what can safely be described as psychedelic music in some form or other. The press release by Kraków-based label Instant Classic (something of a keystone in assembling and issuing much of the work of these Polish musicians) even says, "one can ponder if Innercity Ensemble is a regular band or side-project". 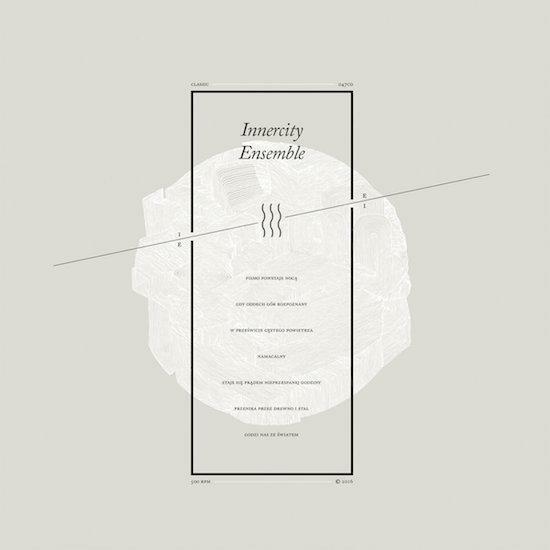 To my ears, Innercity Ensemble is certainly the former, though also more akin to a minor Gesamtkunstwerk, synthesising strands from the various projects of its members into something grander and all-encompassing. At the core there’s the scurrying tribal percussion of T’ien Lai and vast unpredictable soundscapes of Kuba Ziołek (aka Stara Rzeka) and Artur Maćkowiak, both deploying their guitars into a network of effects. Then there’s the alien colouring of HATI (aka Rafał Iwański and Rafał Kołacki), emanating from behind a mess of gongs, rattles, bells, and granite blocks. Most protruding however is the trumpet, flugelhorn, and cornet of Wojtek Jachna. Jachna has what appears from the outside to be the strongest connection with Polish jazz in the group, playing swinging fusion with both Sing Sing Penelope and the Contemporary Noise Quintet/Sextet. With his often outrageously beautiful playing floating above the mesh of his bandmates, it’s tough not to be reminded of early-70s Miles Davis or Wayne Shorter, soaring over the murky grooves of On the Corner or Weather Report’s I Sing the Body Electric. III sets itself apart from Innercity Ensemble’s previous releases by focusing in on the group’s core of tribal trancelike rhythms while also trimming things down substantially in terms of overall running time (especially in comparison to the sprawling double album length II), described by Kuba Ziołek as "a result of a better sound selection". Five of the seven numerically titled tracks on the record sit around the five-and-a-half minute mark, with only the opener heading close towards ten. II - also recorded in the same palace at Ostromecko - was clearly themed around a meeting of light and dark: half the tracks were titled after ‘White 1’, ‘White 2’, etc., delving into unfurling grooveless soundscapes infected by hissy noises and chaos implying whiteness as the colour of blindness, emptiness, and surrender. The other half were titled ‘Black 1’, ‘Black 2’, etc., riding comfier (and krautier) grooves and repetitive motifs, seemingly seeing blackness as an cool and assuring colour of certainty and all things Earthbound. III amps up the trancelike tribalism of those ‘Black’ tunes, jettisoning drum kit beats for lattices of hand percussion akin to Miles’ key 70s rhythm section, including amongst others tabla player Badal Roy, percussionist Mtume, and Jack DeJohnette behind the drum kit. Most of the group get roped into the percussive battering - particularly on the first two tracks - with guitars getting bowed and synth textures cycling around the drum skins. The ten minute opener builds from a chorus of Eastern-sounding pipes and flutes to a veritable march of hand percussion. Jachna’s horn playing soars overhead like a jolly drill sergeant, parping out distinctly melodic major key themes that prevent things from straying into bleaker territory. Elsewhere the record does wander into regions unbound by rhythm. The third track is practically a theatre of the absurd, where party horns and dull thuds patter around between the palace walls like a kids’ birthday planned by David Lynch. Similarly, the penultimate tune is filled with vacant space surrounding an electric piano ostinato, filled out rather beautifully with washes of tinkling bells and cymbals around which the trumpet snakes a ponderous path. The album’s magnificent centrepiece however, is somewhat inevitably the monstrously heavy fifth track. The most funkified rhythm in the group’s catalogue suddenly veers into a spiralling crescendo, and races on for eight explosive minutes. Removed from the noise of the mainstream, tucked away in (literally) a palace away from the city, Innercity Ensemble successfully achieve what not only the 1970s American jazz fusion movement did, but also what contemporaries such as Copenhagen’s Selvhenter, Chicago’s Good Willsmith, or even our own Teeth of the Sea manage. Like Marvel’s Avengers a group of likeminded musicians assemble, and their task is merely to create an immovable object to shield against the unstoppable force of comfortably unadventurous aesthetics and mainstream logic. On III Innercity Ensemble are easily at their strongest yet (or as Ziołek described it, their most refined and sonically well selected). The results are utterly uplifting, and it’s yet another high watermark in the currently infallible Polish underground.